Here at The Cooks Next Door we are very excited about an opportunity Alaina has to travel back to Kazakhstan this April. Alaina's two oldest children were born in Kazakhstan and so she and her husband have a very special place in their heart for this country. Alaina will be travelling with an organization called Two Hearts for Hope -- a non-profit dedicated to supporting the needs of orphans in Kazakhstan. While in Kazakhstan the team will be building a playground for the benefit of some of these children as well as spending time showing love to the orphans. We're hoping Alaina will be able to keep us updated on the team's progress while they are away (and maybe even throw in a word or two about what she's eating). So, in order to help with this effort, we're hosting an Etsy sale in Alaina's benefit through the end of February. All sales (100%) will go directly toward her trip. 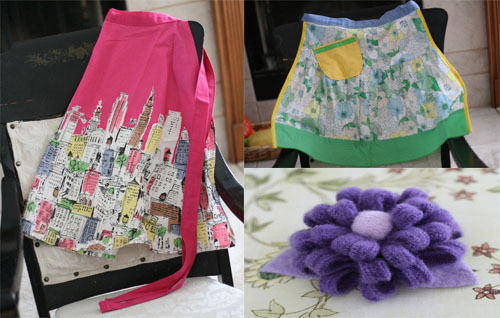 There are plenty of cute aprons, a few tea cozies and lots of beautiful felted flowers to choose from. So hop over and have a look!